Plot Summary: Shima has always strove to be an excellent obedient child to his parents and to others, but in the process he could never be himself. Because of this he has always felt lonely, even with all the people who say they love him. When the picture of his recently deceased grandfather falls into the ocean, Shima nearly drowns jumping in after it. He is quickly saved by a mysterious man. In a daze Shima confesses his loneliness to the stranger, who then vows to stay by Shima's side for as long as he needs him. 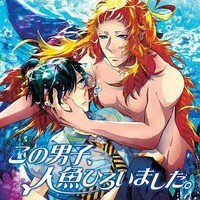 Shima quickly finds out that this stranger is a merman. Shima takes him home, and names him Isaki. Isaki and Shima quickly become friends, but find out that their feelings for each other might go past that of friendship.